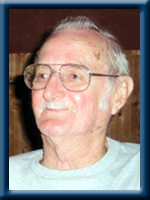 ORME – C. Edward, 81, of Liverpool , Queens County, passed away peacefully on Friday, May 16, 2014 in Fisherman’s Memorial Hospital, Lunenburg. Born in Liverpool, he was a son of the late Charles and Jennie (Whynot)(Schrader) Orme. Eddie worked for a time with Earl Amirault Electrical before moving on to the Town of Liverpool, first as a temp, then as a full time labourer in March 1968. He advanced through the years to a heavy equipment operator then later as a foreman, a position in which he retired from in March 1996. During the course of his work with the Town of Liverpool, he surveyed on Coffin Island. Eddie was an avid outdoorsman enjoying hunting and fishing with his family and friends, especially in the back country around Milton, Little Kenny Hill Brook, the upper regions of Five Rivers Brook and the Old Garden Road. He loved animals, especially the family pet, and going for drives with Hazel and “Bear” on a Sunday afternoon. He is survived by his wife of 57 years, Hazel (Jollimore); his daughter Eleanor (Sherman) Roberts, White Point; his sons, Wayne (Wendy) and Terry (Donna), both of Milton; grandchildren Jacob Roberts, Nicolas Pinhey-Orme and Benjamin Orme. He was predeceased by granddaughters, Danielle and Sarah; sisters Eleanor and Ruth; brother, John “Jack”; half sisters Jessie and Shirley; half brothers, Clyde, Andrew, Ronald and Virgil. So sorry to hear of Eddie’s passing. Hold the good memories close, they will comfort you. My sympathies to all of you……..
Wayne and the Orme family,sorry to hear about the loss of ur dad.Remember all the happy times you had together. My sincere condolences to you all, sending thoughts of comfort, peace and courage during this difficult time of sadness. To the Family Sorry to hear about Eddie . Our thoughts and prayers are with you all . My sincere condolence to the Orme family.Cherish the memories you have of Eddie and know that he is now at heavens gate and passing through. It is with great sadness to know that Eddie has passed on and our condolences goes out to Hazel and the family.Eddie and his family have been very close friends for many years.The times we shared at camp are something we all .charrish very much and often.He was a true friend and I will think of him often with sadness.we will hold those memories for ever.God bless you all. Our sincere condolences to you all, our thoughts are with you. Terry, Donna and Benjamin, we are so sorry for your loss. You are in our thoughts and prayers. So sorry to hear of Eddie’s passing. He was a great man and I had many laughs with him during our working time together with the Town of Liverpool. I am sure he has left the family with many great memories for you to cherish. hazel and family,sorry about eddie he will be missed by all who knew him. dad and him along with others went rabbit hunting for many years and they caught their share of rabits. i know how it is to lose a loved one. i miss talking to you and as i went by eddie always waved to me. so i am thinking of you hazel. well dad will be happy he got a friend to talk about hunting. take it easy hazel and share all the mem ories you have and always had with him. To the family of the late C, Edward Orme, I wish to extend my sincere sympathy on the loss of your loved one. We were so sorry to hear about Eddie’s passing.Please know that we are thinking of you all.Hold on to your memories as they will help you get through the days ahead.R.I.P. Eddie . We are so sorry to hear of the passing of Eddie. Our deepest sympathy to all of you. The Family is in my prayers. We were saddened to hear of your Dad’s passing. Take comfort in the memories you shared, it will help you get through this sad time. Know he is at peace, thinking of you and your family. We were so sorry to hear about Eddie.I know he will be greatly missed . We had lot”s of good times and many laughs .Our thoughts and prayers are with your family”s. To the family ,so sorry to hear of Eddie’s passing..R.I.P. Eddie.you will be missed. Mike and Sandy. Our sincere condolences to you all. Just a little note to say we are thinking of you at this time.